Nearly every household has a fridge that completely wastes at least 30 kwh of energy every month. Most of that energy is wasted every time you open the door. Cold air is heavier (warm air rises, remember?) so it falls out onto the floor every time you open your fridge, and warm air from outside rises to fill the space it left. But with a top opening fridge; even if you leave the door wide open, gravity effortlessly keeps the heavy cold air down, inside the fridge. Using this principle, a clever Australian inventor, Tom Chalko has converted a deep freeze into an incredibly efficient refrigerator. He chose a freezer because they are top opening. The only difference between a freezer and a fridge is the temperature maintained inside: freezers are colder. Freezers maintain freezing temperatures, while fridges operate somewhere between 0 to 40 degrees Fahrenheit. But, if converted to a fridge, it only has to run for a minute or two every hour to maintain normal fridge temperatures. So turning a freezer into a fridge just meant installing a simple external thermostat to cut the power off when it reaches the temperature that Tom set. 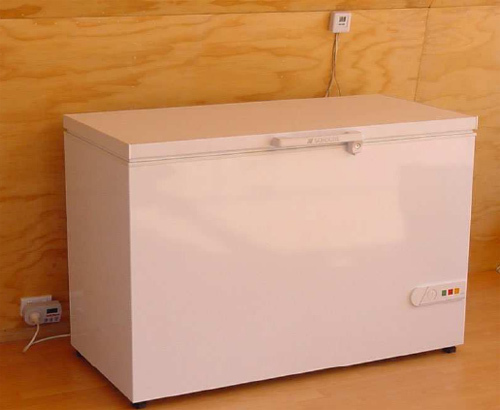 His home-made fridge uses much energy in 24 hours as a 100 Watt light bulb gets through in just an hour. Not only is it energy efficient; but it’s absolutely silent too. The thing is only running for a minute or two every hour. At all other times it is perfectly quiet and consumes no power whatsoever. I wonder why no company has thought of this easy way to cut energy use in fridges? All you clever designers out there; leave your thoughts on how to make a top-open fridge easy to get stuff in and out of. You just need a way for drawers to slide up, so you can access the depths without leaning down into a huge box. Devise your system so it needs no electricity, of course. This entry was posted on Wednesday, August 12th, 2009 by Susan Kraemer and is filed under Appliances, Green. You can follow any responses to this entry through the RSS 2.0 feed. You can leave a comment. That is hilariously awesome. Wow. I want one. Terrific idea, thank you for writing about it. Maybe some company will come up with such a product for the mass market. Sometimes improvements consist of "working" smarter, not harder. In case anyone has not yet heard this or figured this out, there is a LOT of hidden waste in industrialized societies. It is time to start squeezing them out, as this refrigerator does. You write "Freezers maintain freezing temperatures, while fridges operate somewhere between 0 to 40 degrees Fahrenheit". Anything below 32 degrees would be freezing on the Fahrenheit scale. A very good idea, certainly, but far from a new one. In the homebrewing world, folks turn chest freezers into Ã¼ber-efficient kegerators all the time. In that case, you will often see a wooden surround placed between lid and the chest freezer through which tubes and taps can be run. It impacts efficiency surprisingly little. Any decent homebrewing store will sell a temperature controlled relay. Make it open up like a tackle box. put some hydraulics like in hatchback cars to keep lid open. You can buy the freezer and the external thermostat here. This problem has already been solved in campervans and yachts where ultra low power refrigeration is important – almost all fridges in these applications are top loading. The barrier to uptake in the home is convenience, no one likes digging bent over in a chest freezer for the frozen chook at the bottom, let alone digging for leftovers in the bottom of a chest fridge. 10 points for self retrofitting an existing appliance by using a simple electronic power timer on the wall outlet. You could put a horizontal plastic sheet across each shelf which was held in place with elastic so you could pull it aside when trying to get to the food. It would help to keep the cool air in. Or, you could eliminate shelves and just have the fridge contain large air tight drawers. The air would be cooled inside the drawers so that you would only lose a little bit of cool air when you pulled them out. Add a solar panel and this can really perpetuate itself! i know that is quite a lot but still it is a 220L fridge it has to take this much energy..
You could use that system that some posh CD holders have, where they move around on a kind of conveyor belt system – the drawers would rest at either end on a chain of some sort that moves around (like along and then down and along the other way and then up), so when you push a drawer they would all move round. Well, I know what I mean. Varun: The only substantial difference between the refrigerator in the article and the one in your home is the energy lost when the door is open. If you rarely open your refrigerator, it should have very similar power usage assuming similar efficiency ratings. I have a friend who installed a hydraulic lift system in his. It replaces the hinges so when you press a button the top moves up allowing access to the interior while keeping the top available for counter space. Great idea. I just bought a new LG refrig/freezer for a small kitchen apartment. This appliance is anything but small. How big a fridge/freezer does one person need? Can this fridge be made with a small freezer? The energy savings is great! The chest style needs room to open the lid so it can not be put under a counter top. Could the lid be made to slide forward and down? Where I can get this fabulous invention?? Details, please! I had a small chest-style freezer which I put on wheels. Then I rolled it under a counter top. I could pull it out without disturbing the items on the counter, and even use it as an extra countertop when I needed one. Baskets inside solved the problem of access, more or less. If it had been thermostatically controlled to be used like a fridge, I think I would have invented a weight and pulley system to lift the bottom baskets. Great! I found a 12 volt top opening refrigerator at Lehmans.com, but it's German designed, Austrian made, and costs $1,500 plus freight. This, however, may well be affordable. Thanks for the link, and I'm now for your home page. Have you seen those folding out sewing baskets or tool boxes? Where once opened they resemble "steps" and everything can be seenat once? Well, I am suggesting that this idea to lift out shelves from a chest style fridge. – The use of strong, lightweight aluminium mesh framing. Long handles to open up and out, left or right only or both sides at once. All heavies or long items like bottles that need to be stored upright can have the lowest, deepest "step"at the bottom of the chest. As an added feature, movable compartment separators can be included so that one can customize how they store items. This is a very simple solution, yes? s a policy wonk and investment analyst specializing in Renewable Energy and Energy Efficiency. I'm an Italian Ceramic Industrial engineer.i've designed and trained 4000 rural women in Nigeria on how to produce GREEN fridge for keeping fresh food/meat/fish to remain fresh for 36 days without power.they use same to reserve insuline for 30days.I'm ready to train rural women to master this technology anywhere in the world FREE by INVITATION.